- Please see links below for order form and garment photos. - Samples of some of the garments will be at the school from Tuesday, November 14 through Monday, November 20. - Deadline for orders is Tuesday, November 21, to the school office. - If paying by check please make checks payable to Pettisville Schools. Lima Sporting Goods will not accept personal checks. Lima Sporting Goods WILL accept cash, money order, or credit cards. Credit card payment information is located on the order form. - Embroidered items will be embroidered with Blackbird on the Pettisville Block P. The embroidered logo is on the order form. 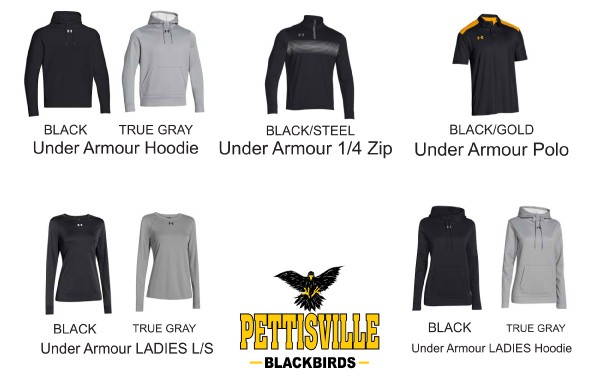 - Screened printed items can be screened with either a Pettisville Blackbirds Logo or Pettisville Basketball Logo. Please indicate which logo you are selecting for your items on the order form.